Ruiz fell to all fours on a delayed reaction and once he regained his balance, referee Jack Reiss ruled that the title challenger, wobbly while he listened to instructions, was unable to continue. Reiss halted the contest with one second remaining in the opening round as Davis scored his eighth first-round KO. Davis (21-0, 20 knockouts) retained his 130-pound title — and his status as The Ring’s top-rated junior lightweight — in his first televised main event in the United States. The 24-year-old was originally slated to fight former three-division titleholder Abner Mares, but he suffered a detached retina during a sparring session last week. So Ruiz (39-5, 30 KOs) received the call on 10 days’ notice to salvage the event during Grammy Weekend in Los Angeles. Davis competed just once in 2018, but he pledges the inactivity – and issues that plagued him — are behind him. 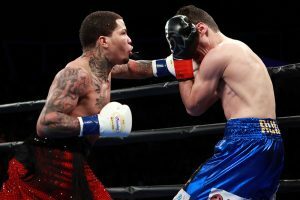 The post Gervonta Davis retains 130-pound title with first-round knockout of Hugo Ruiz appeared first on The Ring.